Africa’s women entrepreneurs need access to a wide variety of business support, advice, inspiration and motivation from others who have been there and got the proverbial t-shirt in the world of business building. There are an increasing number of inspirational women authors across the African continent and globally who are publishing fascinating books to fulfill this need, and at this year’s Lionesses of Africa Conference we are introducing five of them, all based in South Africa. These highly knowledgeable writers will be showcasing their latest books, offering their insights and expert knowledge, and of course, networking to help women entrepreneurs to greater success. Lori Milner is the engaging facilitator, thought leader and mentor known for her insightful approach to being a modern corporate woman. Her brainchild, the successful initiative Beyond the Dress, is the embodiment of her passion to empower women. Beyond the Dress has worked with South Africa’s leading corporates and empowered hundreds of women with valuable insight on how to bridge the gap between work and personal life. Clients include FNB, Siemens, Unilever, Massmart, Alexander Forbes and Life Healthcare. Her new book, co-authored with Nadia Bilchick, is Own Your Space. Tumi Frazier is a South African entrepreneur, professional speaker, author, TV personality, consultant, and founder of Tumi Frazier International, Tumi Leadership Academy, and Tumi Foundation. Tumi is an internationally acclaimed Leadership and Change Management expert who has worked with high profile clients and organizations across Africa, United States and Europe. Tumi has authored 4 books: Courageous Stories of Inspiration; In the Midst of the Storm; Stepping Stones to Success; and Your Moment. Shirley Anthony is an author, speaker and owner of Marketing Breakthroughs, a marketing consultancy operating for over 20 years. Having initially gained corporate experience in fast moving consumer goods branding, she has consulted in over 24 industries including cellular, information technology, travel, engineering, food, cosmetics, architecture and banking. This diverse experience, together with managing her own consulting practice, has given her first hand insight into the challenges business owners face and possible solutions for overcoming them. She shares her own learnings and those from many other entrepreneurs, in an entertaining style in her new book The New Entrepreneur: A Practical Marketing Guide for Growing Your Business. Anna Shilina is an insightful author, engaging speaker and entrepreneur. She was born in Ukraine and grew up in South Africa. Over the past decade, Anna has amassed a wealth of experience in various business sectors, which is a testament to her entrepreneurial spirit and flexible resolve to make any business a success. Anna is an ever-evolving entity, eager to add value to people’s personal as well as professional capacities. She is a dynamic speaker and trainer on various business and personal topics. Her experience ensures that the knowledge she imparts is practical and can be applied with ease. She shares her passion for personal development and entrepreneurship in an explosive way, leaving you energized and wanting more. She loves adding value to businesses and people’s lives, as well as exceeding expectations and raising the standard in an industry. She is inspired by people who are true to themselves, follow their hearts, and enjoy life. 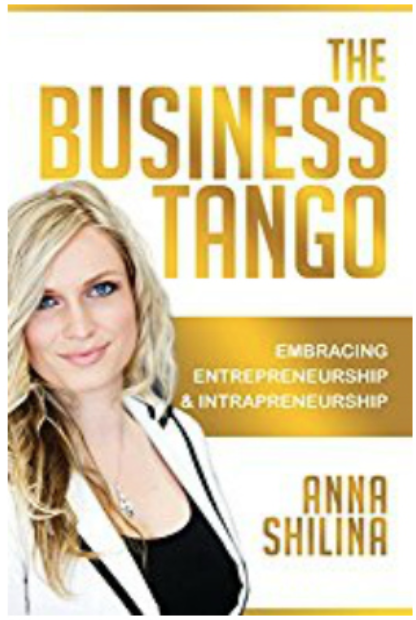 Her new book is The Business Tango: Embracing Entrepreneurship and Intrapreneurship.